Mention Imelda Marcos’ name, and the first thing that comes to mind are shoes. Lots of them. 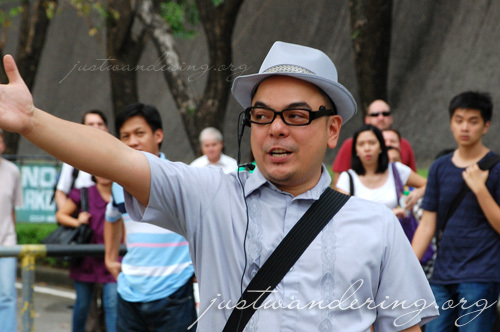 But there was no shoes in Carlos Celdran’s tour; just a mention of them. What’s in the tour are two gorgeous buildings designed by National Artist for Architecture, Leandro V. Locsin. The unmistakable shape of the National Theatre. So what’s Imelda got to do with the tour? 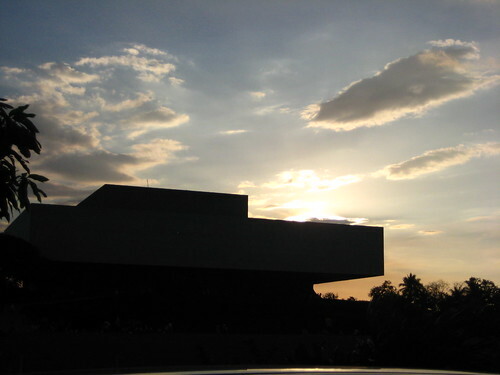 The CCP Complex, which encompasses several buildings, including the Cultural Center of the Philippines (National Theater), the Philippine International Convention Center (PICC), the Folk Arts Theater, and the Manila Film Center, was Imelda’s pet project for promoting the arts and culture of the Philippines. Carlos’ tour of the complex is told through Mrs. Marcos’ life, giving a background on Imelda’s simple beginnings, her aspirations and her eventual rise to being the first lady. The tour starts at the CCP Little Theater, and we made our way up to the fourth floor. Carlos led us to Imelda’s private chamber, where she welcomes and entertains dignitaries. The private chamber had a sweeping view of the CCP complex and of the Manila Bay beyond. From there, we went through each floor, perusing galleries and admiring art from the CCP’s private collection. From the CCP, we made our way out to the streets and walked towards the massive PICC. Carlos continues the tour, mixing in some juicy chismis (gossip) along with historical facts as we walked through the halls of the convention center. Though we only toured the premises of the CCP and the PICC, the tour also touches upon the formation of the Folk Arts Theater, the Coconut Palace and the controversial Manila Film Center. The tour is a fun way of learning about the Philippines in the 70’s, made interesting with Carlos’ theatrical way of telling a story. Just as the gossip was getting too juicy, he reminds us that rumors are just that: rumors. Unverified and unreliable. Makes you think, really. As he ends the tour, he leaves us with this message: if you can’t change the way Manila looks, change the way you look at Manila. Carlos leads four walking tours of Manila — Intramuros (regular and deluxe, which includes Fort Santiago), Binondo and Quiapo and the CCP Complex. 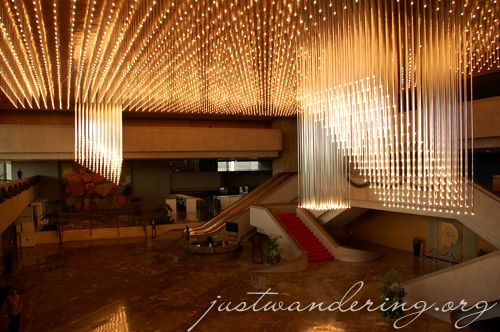 Tour Descriptions, dates and rates are available online in his blog, Walk this way. He also conducts overnight tours to Corregidor. …WOW. I’d LOVE to go on that tour. Just looking at the interior screams, “VISIT ME (even if you don’t support Imelda)!” Also, did Imelda Marcos promote art from Filipino artists? I’d want to visit to view her art gallery. By the way, what was your favorite part of the tour? She collected Michelangelo’s :P The art on display are from the CCP’s collection. Art by Filipino artists, of course. I wasn’t able to write this in, but my favorite part would be when Carlos asked us all to stand, put our hands over our hearts and started singing the national anthem. Oh, and cameras are not allowed inside the CCP. Have been to these buildings before but listening to Carlos and the “rumors” is something I’d like to add to my experience someday to spice up the perspective.